Aexeon Quattro is a low-cost, real-time video acquisition and compression board for applications where multiple video streams are needed. Available in either PCI or PCI Express formats, Aexeon Quattro incorporates a digital media processor and on-board frame buffer for reliable capture for the most demanding application. Aexeon Quattro contains four independent full-resolution video channels capable of simultaneous streaming of real-time video to system memory or display. Aexeon Quattro also comes equipped with all the necessary I/O control to make application development easy. 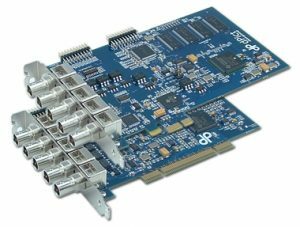 Aexeon Quattro can be ordered in either PCI or PCI Express system interfaces allowing for system compatibility well into the future. PCI Express is the high-performance, next-generation interconnect that increases bandwidth, scalability, and reliability. Aexeon Quatto's high speed bus-mastering capability with scatter gather support delivers realtime video data to system or display memory simultaneously, without intervention from the host CPU. Video data formatting and resolution is independent between streams, allowing for maximum bandwidth flexibility. By incorporating an on-board video processor, Aexeon Quattro enables maximum flexibility in handling challenging application requirements. Equipped with up to 64 MB of SDRAM frame buffer memory, the video processor provides smooth scaling, realtime JPEG compression, pixel formatting, interrupt support, hardware overlay, real-time video processing, and video output functionality. Aexeon Quattro has four independent video digitizers and simultaneously delivers fullframe, full-resolution video from all channels in real-time in both NTSC and PAL formats. Video can be captured and stored in either square pixel or CCIR-601 resolutions, and can be scaled to any arbitrary size. Aexeon Quattro also supplies a video output with OSD that can be programmed for single camera or multi-camera (2x2) output in NTSC or PAL format. The video output is independent from video input, allowing for different frame rates between the captured video and what is displayed before going to the video output. Aexeon Quattro contains extensive camera and I/O control to make application development simple. By utilizing an on-board microcontroller, Aexeon Quattro provides reliable image transfer, RS-232 serial interface to control cameras, motion detection, and watchdog timer functionality. Eight programmable general-purpose triggers and four relay output alarms can be used for event or alarm verification. dVeloper is a comprehensive software developers kit that supports all dPict Imaging products, allowing for easy porting to new hardware. dVeloper is royalty free and runs under Microsoft Windows XP, Vista, and 7 operating systems. Source code samples and complete documentation are included in Visual C, C#, and Visual Basic .NET to provide insight to various hardware functions. Samples include video-in-a-window, overlay, video buffering, camera control, and more.